When it comes to cooking, I would call myself an intuitive cook. I'm pretty awful at planning just the right ingredients for what I'm going to make. I work a little backwards if you will. I prefer going to the market, finding one or two ingredients that stand out and trying to figure out what I can do with them. This week it was figs...figs for everything! I used them for my most recent magnesium post and decided while I was at it, that I would make a magnesium salad. What? By that I mean, after eating this salad, you can be fairly certain that you're meeting your magnesium daily value intake. If you care about that sort of thing, of course. When it comes to making salads in particular, I prefer simplicity. I like flavors to stand out and mesh well. Too many ingredients on a plate make me nervous. Have you ever gone out to eat, excited to order a salad that sounds fabulous on paper only to be royally disappointed when you take the first bite. Finding yourself with mismatched ingredients that don't work well is kind of a bummer. More is not always better, my friends. I mean, the good thing is, you can always order another glass of wine to soothe your disappointment. But back to the salad du jour. You can get a little crazy if you want and toast your pumpkin seeds or keep them raw. Toasting them a bit will add a nice nutty flavor. The dressing is simple. Since I've been obsessed with it, I add it to everything these days. All you need is a little pomegranate juice, Dijon mustard, a bit of balsamic, olive oil and salt and pepper to taste. You won't be disappointed! Combine all ingredients under dressing and whisk until well incporporated. 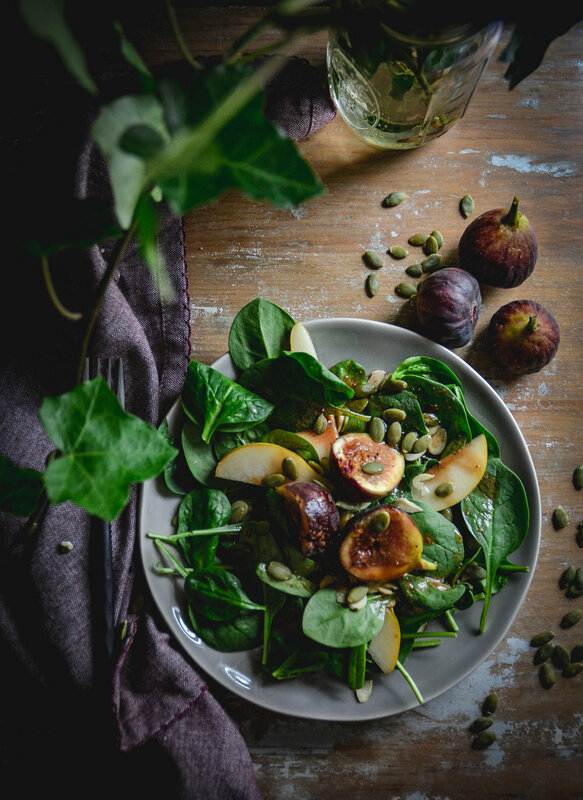 Place spinach on the plate, add pear, figs, drizzle with dressing and sprinkle with pumpkin seeds.